This is twelfth and last in a series of blog “snapshots” of how Mercy students benefit from using iPad technology (and other tools) throughout the school day. Tech in the MHS Math Dept. This is the tenth in a series of blog “snapshots” of how Mercy students benefit from using iPad technology (and other tools) throughout the school day. Patty Perry uses Explain Everything to make tutorials for students to explain difficult concepts. She also uses it to respond to email or message questions. This is the ninth in a series of blog “snapshots” of how Mercy students benefit from using iPad technology (and other tools) throughout the school day. The Mercy College Counseling Program is more than a guidance service for choosing a college; it is a program designed to assist students in identifying colleges that are considered to be a “good fit” academically, socially, and personally. We strive to help each student develop her understanding of who she is, what is important to her, and what she hopes for her life after Mercy. To help us with this endeavor, Mercy utilizes a comprehensive online college planning tool called Naviance Family Connection. , a college and career readiness platform that enables self-discovery, career exploration, academic planning, and college preparation for our students. To introduce the various aspects of this resource to the student body, Counselors facilitate classroom lessons at various points during the 9th, 10th, and 11th grade years. This spring, Mercy Counselors met with all freshmen students through their World History class. The focus of the meeting was to help students create their personal account with Naviance Family Connection. Counselors demonstrated how to create an account and assisted students with this task while they worked on their iPad. Counselors also met with sophomore students through their English class. The focus of the sophomore classroom meetings was to introduce the students to the college planning and search features of Naviance Family Connection. Counselors demonstrated various functions of this online college planning tool and had students work along with them on their iPads as they explored things like: how to search for a college based on personal interests; how to learn about a college’s admission requirements; how to learn about major offerings at a college; how to know if a college is a good academic fit for a student based upon grades and test scores; how to begin building a “college list” of schools the student is thinking about, and how to build a resume to name a few. All of this leads up to the junior year – one of the most important years when it comes to college planning. We want students to have the tools and accurate resources to help them reach their post-secondary goals. Tools like the iPad and resources like Naviance Family Connection have taken the college and career search and planning process to a whole new level. — Kristen Casey, Chairperson of Counseling Dept. MHS Coaches Active with Apps! This is the eighth in a series of blog “snapshots” of how Mercy students benefit from using iPad technology (and other tools) throughout the school day. Parents and families can easily update the records. The Athletic Trainer can access all medical records from any location. Information is far more unlikely to be misplaced. It’s easier to determine if all information has been submitted. For taking class notes, students have a strong preference for Notability over other apps. Students volunteered that they enjoyed its ease of use, the ability to diagram on the app, split screen with a book, and organize their notes. The ability to highlight and color code was also remarked upon. The students on the committee were not surprised by Notability’s as the iWizards themselves signaled this preference last year when they shifted from iAnnotate to Notability for their new student tech orientation. A second very interesting finding was that so many students depended on Quizlet in order to study and review materials. They enjoyed the flashcards, language features and options for reviewing . The committee concluded that Quizlet should be included in future orientations. The students on the committee said that both apps were attractive because they allowed students to individualize study methods. We felt that some of the other apps like Schoology, PowerSchool, Google Docs, and Pages stood out as essential because course workflow more or less mandated their use. That said, we thought it was interesting that a slightly greater number of the respondents use Google Slides than Keynote. In retrospect, we think question #3 about “What apps would you like to learn . . .” was not well conceived. 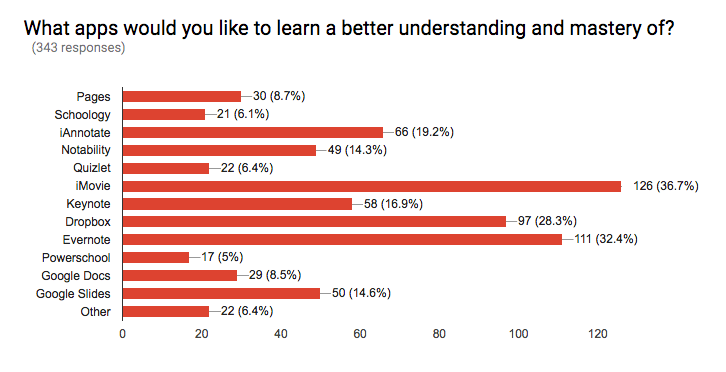 In the case of Evernote, for example, we think more students may have wanted a better understanding because they had not heard of it (Since only 3% expressed that they regularly used it). On the other hand we thought that 37% of the students expressing a desire for better mastery for iMovie needed to be addressed through the school curriculum. Teachers may be assuming that students have a better mastery of the app than they actually do. We need to teach them how to use it. Finally, the iWizards have always debated what to recommend in regard to iPad keyboards. The school does not sell nor require iPad keyboards. 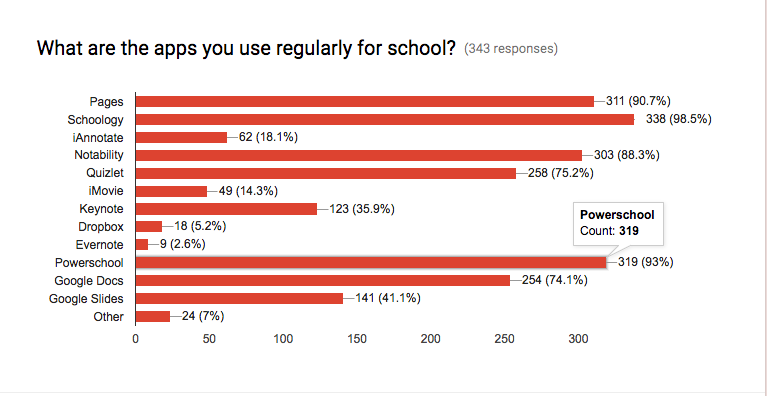 Now we have some data: Students stated that they were mainly using three brands: Belkin, Logitech, and ClamCase. Going forward we can share this information without endorsing a product.